AKA And *that* is how you do Christmas Movies. Today is the day!! The very first day of Christmas excitement!! We’ve been busily making gifts for each other and planning secret plans to make people smile but this is one of the non-traditional traditions that is expected in our house. No secret surprises here, though I’ve added a couple of new titles to the list. Christmas in a house full of nerdy movie buffs wouldn’t be complete without watching the best Christmas movies ever made. And while I know my list isn’t exhaustive – Harry Potter isn’t even on there – it is one that keeps us highly entertained without the eye-bleeding sweetness of traditional Christmas movies. Mayne, long suffering husband, good natured tormentor of children and aficionado of ‘dad jokes’ has been off work sick for the last week with bronchitis. Ash, 14 years old, future world traveller and girl of many scarves, has been off school as it is school holidays. Me, I’m in the sucky position where I have to behave like a grown up because people will die of scurvy or neglect if I don’t. I come home from work and after stopping at the shops and head straight into the kitchen to dump the groceries before going out to kiss all my people having between away from them all day. Ash, however, beats me to it and comes into the kitchen to meet me. Firstly I’m a little taken aback, this is not the child who offers to do housework. The other two, yes. This one… not so much. But I recover in fine style and don’t let on how shocked I am. How foolish of me. I should have realised that I was living in The Sisterhood of the Travelling Trackies. She proceeds to spend the rest of the evening being chivalrous, helpful and making really bad puns to continue her internship. Much laughter and discussion on the pros and cons of being each of us ensued. Apparently M&M’s are a big pro to being Dad. Exercise is a con to being Mum. I love my kids so much. They’re hilarious little weirdos. I’m still having trouble getting my head around the fact that my daughter has turned 16 in the last couple of weeks. My sweet little baby with the blonde ringlets is gone and in her place stands a fiercely independent young woman who is smart and funny and confident and beautiful and everything I wish I was at her age. She is also a disorganised swine. So when she gave me 4 days notice that she was changing the date of her birthday party and I didn’t have any time to prepare for it because I had to work and do other boring grown up things I was a bit disappointed because I had huge decorating plans that I thought I had a couple of weekends to bring together. It turns out that when you only have 2 hours some cardboard and scissors in order to bring a party together that you can do okay as long as you’re going for the ‘sleepover fun’ style rather than ‘holy crap this is amazing’ style. Bek wanted a 1920’s style poker party where they gambled on monopoly and go fish. 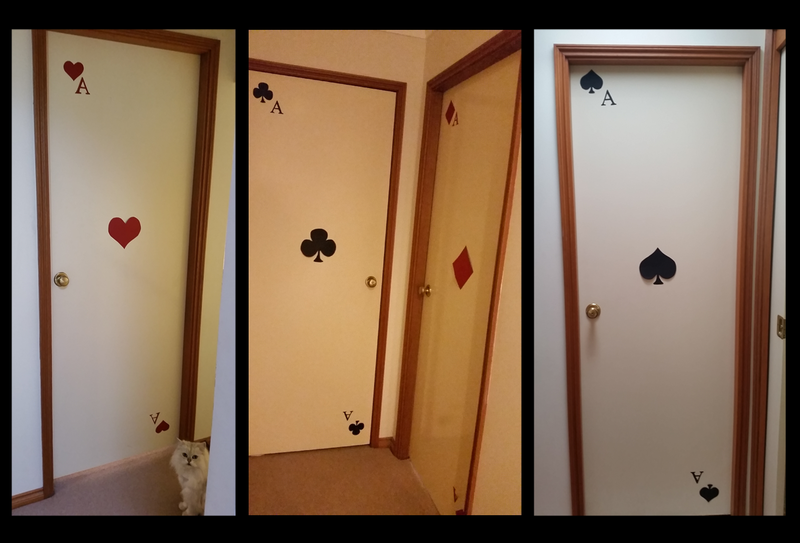 I had grand plans for it, but with no time to shop, make and decorate we toned it down to a playing card themed decorating style with a quick tip of the hat to the 1920’s. I’d already begun a Pinterest board to gather decorating ideas so I quickly had a squiz and then made my templates. I completely love the way the doors turned out. The kitten thinks he is going to get credit for how super quick and easy and awesome these are. But I’m not that nice. No credit for you. and I also used her brilliant list of 1920’s slang. I printed out enough copies for all of them so that they could use them while playing poker. Bek was amazing with her contribution to the affair. 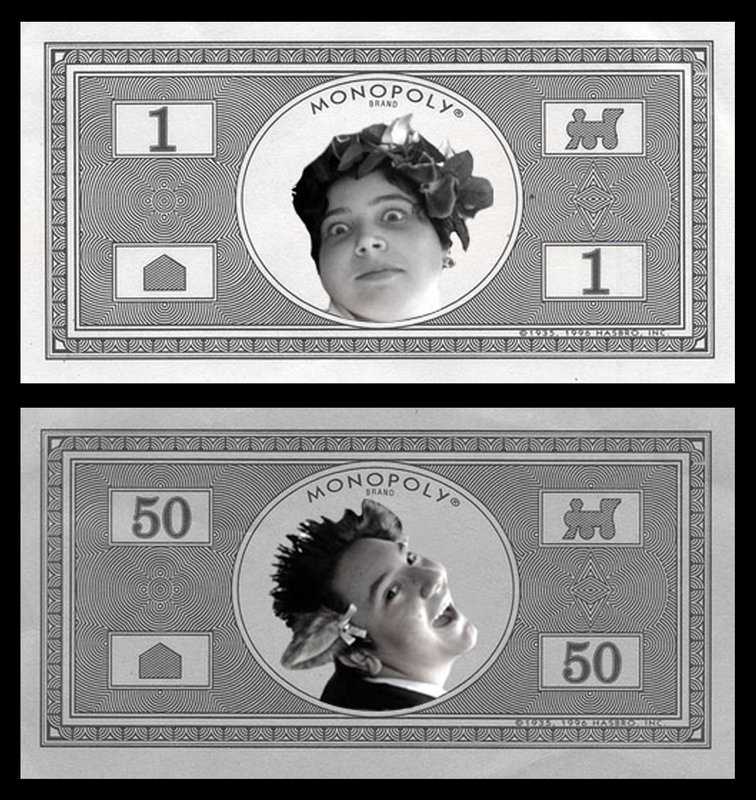 She realised the day before that she didn’t have enough monopoly money for everyone to be able to play so she went online to get pictures of monopoly money and she photoshopped her friend’s faces into the middle and printed out stacks of the stuff. I’d say it was a successful sleepover party in the end, they played games, ate pizza around the fire out the back and then roasted marshmallows and cooked damper on a stick (if you’ve never done this, you should embrace your inner Girl Guide and give it a red hot Aussie try). Sang Avenue Q songs around the fire (editing out the bits the little girls next door shouldn’t hear) and laughed. So much laughter. Such a beautiful noise for a proud Mumma to hear. Weird feet. And a freedom celebration. All the things I value highly in a child and my daughter has them all. I can remember (and it doesn’t feel like very long ago, but in reality it is about 5 years ago) her getting so upset and having me whisper retorts for her to use in the ‘pun wars’ the older kids would have with my husband because she wanted to join in but wasn’t old enough to come up with the jokes. Its hard to believe now. She has become the most amazingly funny and quirky individual who has had us in stitches all weekend. Our fabulous (and quite young compared to us at only 24) friend came to visit last weekend and Ash spent quite a lot of time with her splashing in the ocean on rainy days and failing miserably at navigation and trying on her clothes. Well, scarves really. All of them. And mine. All of them. At the same time. I lived 16 years in an unhappy and domestically violent marriage. We don’t need to go into it too much, but suffice to say that I learned early how to keep myself physically safe from my drug addicted, alcoholic ex husband and I minimised the physical side of things. That didn’t stop the emotional, sexual and social abuse from happening and it didn’t make him a good father, but I never forgot how easy it was to find myself in a position where I had ‘walked into a door’. In 2008 I finally left him. It was to the point where it wasn’t hidden from the children and I was desperately unhappy. So my children and I, and one of his who opted to stay with me, started our lives together by sitting down and deciding the type of home and lives we wanted to create. They wanted fun, laughter, creativity, fairness, stability, bright colours on the walls and lots of family time and I have done my level best to give it to them. He has also asked for $2,000 to sign the forms. And sent our youngest child a picture of the signed forms and told her she can’t have them unless she does what he says. We have had our passport applications with the Minister’s Delegate with DFAT’s Passports Office for the past 7 months. And I have finally received word that they have been approved. Yes, you heard it. My daughters have passports winging their way to us as I type. Regardless of his power and control antics. Over Christmas he decided that he didn’t want to have anything to do with his children ever again also. Sounds harsh, but you wouldn’t believe how our youngest has blossomed since the instability has left her life. Best thing that could have happened after 7 ½ years of trying to work on a peaceable parenting relationship while dealing with family abuse. So, I want to find an amazing way to let the girls know they have passports. As I don’t have the money to take them to the airport and present them to the girls as we go through check in on the way to a long weekend in NZ, I was thinking about taking them on the cruise we were planning on taking last year when I started making them their beach beds in this post. Unfortunately I became temporarily unemployed and that money bought us food and rent instead. It would be amazing to present the girls with the passports and travel documents at the same time. I should be able to save the final $500 for the deposit by the end of the month to surprise them. Perhaps have a bedroom pizza picnic and have them inside a pizza box. Or maybe put them inside the dishwasher before I go to work and then they would find them when they got home and started doing their chores. Or create a treasure hunt with the passports at the end. I quite like the pizza picnic idea tbh. Any better ideas? I’d love it to be big and extravagant like an overseas surprise holiday but I don’t have the funds for that. Please help me do something amazing for my children and if you can’t contribute, share this page, and my gofundme page on facebook, in emails, on twitter but not on myspace. The only things on myspace are tumbleweeds and crickets. My son is the best boyfriend. I mean that I did done raised my boy right and he understands that it is just as important to show his love on the other 364 days of the year as it is on Valentine’s Day. And the true measure of love isn’t in the cost of the gift that he gives, it is in the actions he displays even when Hallmark doesn’t tell him to. So I am hoping that on Valentine’s Day, you didn’t get roses and chocolates. Now don’t get me wrong, just because I believe in the over commercialisation of the holidays in order for companies to sell us more things we don’t need, doesn’t mean that I don’t love the holidays like Charlie Sheen loves snorting coke off a hookers arse. And it certainly doesn’t mean that I hope that you end up miserable in a corner, crying because your significant other didn’t think to get you anything on Valentine’s Day. It means that I think that you are worth way more than standard, no-brainer gifts. I hope that the gifts you receive required thought and/or effort. And here’s where the title of this post becomes a little less ‘call child services’ and a little more ‘give that lady a parenting medal’; my son remembered that months previously he was watching Man Vs Pin with his girlfriend and she had commented on how much she would like to make a ‘Cloud Light’. 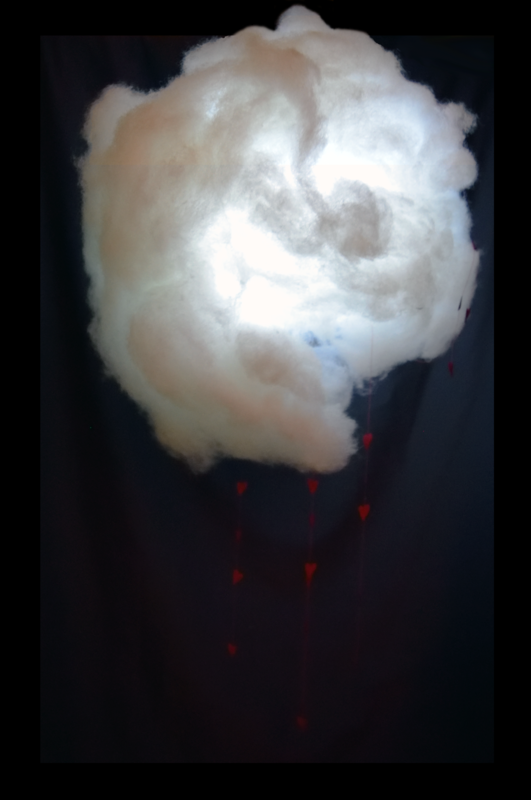 She hadn’t gotten around to it with all her uni studies and so he made her a cloud light, complete with little hearts raining from it. My husband refuses to buy me flowers on Valentine’s Day, he says that he would rather grow me roses than buy me them so that I can have them whenever I want. He believes it is the thought and effort that shows how much he loves me, not the one off flashy gifts. So I often get a nice chai latte in bed on the weekend, or we go out to brunch because he knows that I am part Hobbit and brunch is my favourite meal of the day, or for a drive because he loves indulging my love of seeing new places. And I also get shiny things, but oftentimes we go shopping together after having lunch out so that I can choose the exact piece I want. Fort snuggles and laughter are the best kind of snuggles and laughter. So if you got chocolates, I hope they were your favourite chocolates, and if you got flowers, I hope he cut them from the garden he tends because he knows you love fresh cut flowers or he bought the ones you love in your favourite colour instead of standard red, long stemmed roses (unless red, long stemmed roses are your favourites). Above all, I hope you were treated like you are the most precious person in your partner’s life and they remembered the things that make you happy and tried to bring a smile to your face. 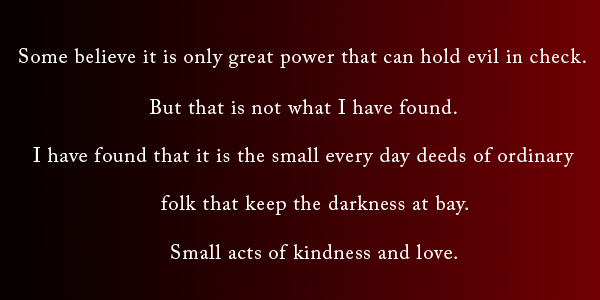 And finally, before I left to give my son a driving lesson I pulled out a deep and awesome quote that teaches us that small, every day acts make a difference, but I didn’t tell her who said it until afterwards. “No” she replied, looking enquiringly. She tilted her head and looked at me as if I had been no help whatsoever and I was just being silly. Now I take exception to this notion she seemed to convey that imaginary people can’t be deep and inspirational. Or right. Because he is right. Just because he isn’t real doesn’t make the point any less valid. I reminded her that a very real man had that thought and wrote it down, in the same way that a Jane Goodall or Gloria Steinham did. Tolkien just did it under the guise of fiction. Fiction I might add that has graced the bookshelves and movie screens of generations for over 60 years and sold over 150 million copies in print and grossed $871,530,324 worldwide at the box office. * Fiction that makes wise thoughts and lessons about the human condition accessible to the masses. The Brown Coats showed us that it is important to stand together and fight; and even if you don’t win the battle – you don’t have to give in and live life like those who oppress you have won the war. Malcolm shows us that there is strength in protecting those who are important to you. Compassion doesn’t mean weakness or softness of character. 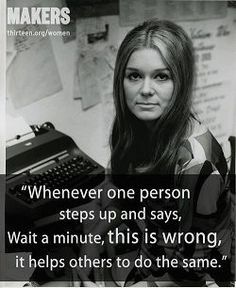 Zoe shows us that women can stand alongside men as equals, without apology for who they are or explanation for their belief that they have every right to do so. Inara teaches us that there is beauty and power in owning your choices, values and sexuality. Kaylee reminds us that there is beauty in the world around us no matter where or when we are and that attitude does not have to be dictated by circumstance. Simon is a constant reminder that family is of the utmost importance and that we should travel to the ends of the ‘Verse to make sure that family, in all its forms, know that we love them and will protect them from harm. And River is instrumental in showing us that no matter how broken we are, we can kill people with our minds we can still make connections the best way we know how, be a valued member of a community of people. And through the broken pieces of our lives and minds, stand up and kick arse when pushed too far. And Jane. Jane reminds us that no matter what happens, assholes can be tolerated and useful in life as long as you remember to be cautious about their motivations and loyalties. So read your children fairy tales. Immerse your teenagers in dragons and wizards and space cowboys. The most important lessons are waiting for them dressed in robes or carrying rings or flying a spaceship. *According to Wikipedia. Please don’t tell my Uni lecturers that I quoted a Wiki as a credible source. I’m not sure if they can issue a failing grade for this blog post, but I don’t want to risk it. **Also, Joss, you know that I love you, your work and your feminism to pieces but I’m waiting for my written apology for killing Wash. I still haven’t come to terms with his death and I’m not sure I ever will. Go stand in a corner and think about what you have done. Fun in the sun – when you don’t like the beach. So we are planning on heading on a family holiday to the South Pacific. 14 glorious nights cruising around 3 gorgeous countries – Fiji, Noumea and Vanuatu. 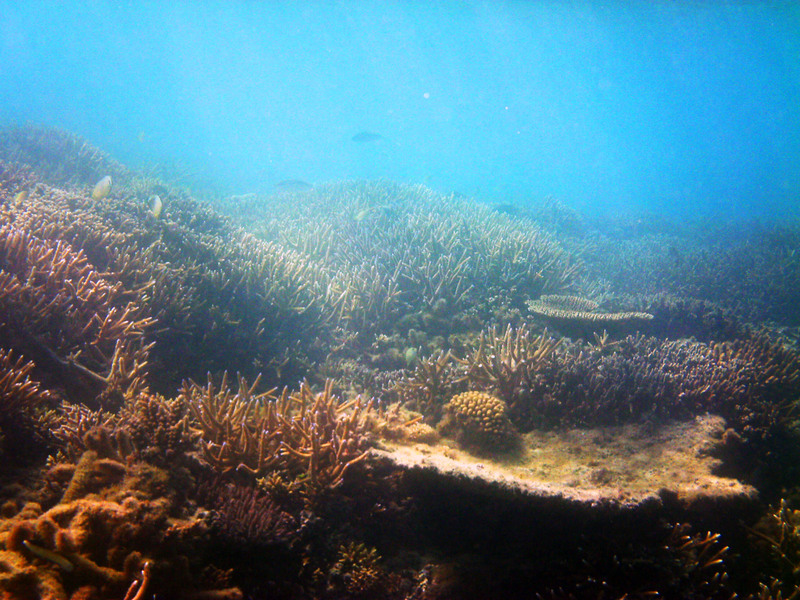 Sun, sand and snorkeling. The only drawback is that, in the words of my youngest daughter, “I’d like the beach if it wasn’t for the sand and the waves.” Also, there is no wifi on Mystery Island, which is a problem if you are an fan-fiction addicted 14 year old who secretly dreams of being a superhero. Who needs wifi when you can be swimming here? Now obviously I want my girls to enjoy our tropical holiday as much as the snorkeling aficionados in the family and since I have not yet been able to convince them that swimming with turtles and all manner of brightly coloured fish is the most amazing experience to have when on tiny islands in the South Pacific, I have come up with a crafty compromise. Well, the amazing Stella at The Golden Adventures of a Very Dark Horse came up with the solution, I’ve just tweaked it to fit with my families love of fantasy and things that deviate from the traditional norm. (And also because I’m essentially a 7 year old in a grown ups body and I like to DO IT MYSELF! *stamps foot in a petulant and precocious manner*). The original post with tutorial can be found here. Seeing Stella’s idea on Pinterest made me think about how I could make the girls’ island adventure relaxing and fun in their own way. We’ve planned horse riding in rainforests and abseiling down waterfalls to cater to their uniqueness, but I want them to enjoy their beach time as well, even though they don’t like to swim at the beach. So with tutorial chosen, I was off to Spotlight and find some suitable material that wasn’t all ‘beachy’. I chose a cotton fabric with a Wonder Woman print for Miss Ash, one of the only DC characters allowed in our house without a heartfelt discussion on why Marvel is better than DC and serious debate over whether Batman is a Super Hero or not. (For the record, my vote is cast for Ninja with Gadgets in the Batman debate. He’s not a superhero.) And then off to the nearest department store for 2 bath sheets in matching colours, I went with a dark grey to satisfy the curled-up-in-her-room-not-being-social-and-reading-by-the-glow-of-the-tablet vibe she has going on at the moment. I’d like to point out that this is an excellent craft to use up bits of left over fabric and upcycle old towels, but this time I’m trying to make a brand new gift for them rather than indulge my inner hippie. So, with 2 beach sheets, some hobby fill, a metre of Wonder Woman fabric and matching thread in hand I was ready to begin the days crafty adventure. The first step was to decide how big I wanted the pillow part of the bed to be, bearing in mind that the finished product will wrap around this, making the finished size of the bag slightly larger than the size of the pillow. 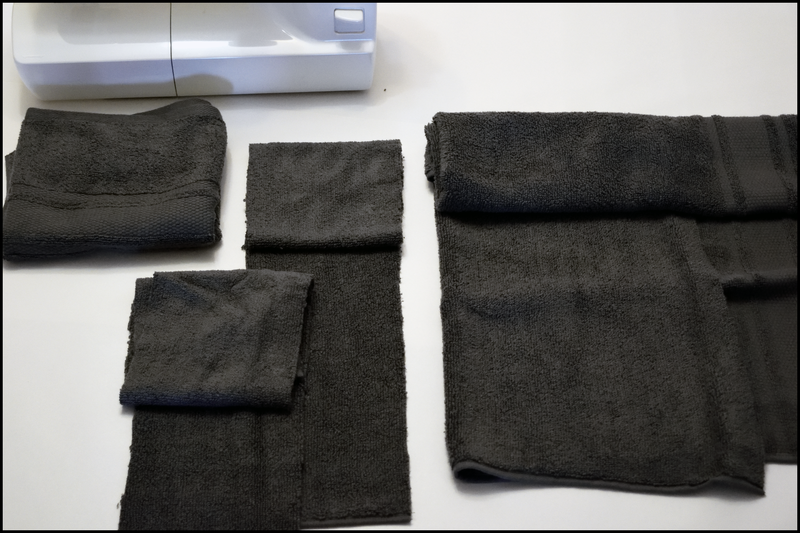 Cut the first towel into 4 pieces as shown below. The large piece is for the pillow, I made mine the width of the towel x 33 cm, the two skinny pieces for the handles and once again they are the width of the towel x 15 cm and the last piece is left overs. Don’t throw it away though, I have a way to use it up at the end. I hate wasting crafty goodies. And tim tams. Never waste a tim tam. I sewed the gap closed and then pinned the second towel over the exposed raw edges to hide them and create the rest of the beach bed. To make sure it was strong and the stitching reinforced for lots of lazing, I sewed it in three separate places as I marked below. 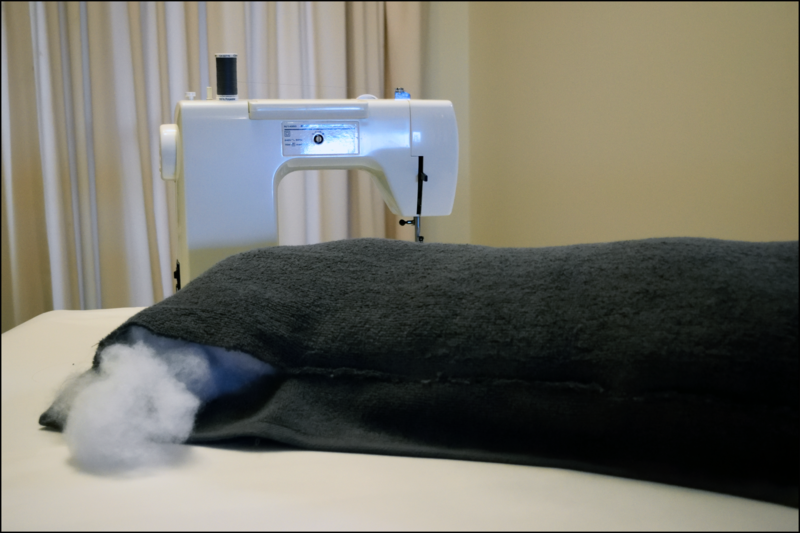 Sewing along the side of the pillow is was awkward, kind of like trying to drive a car with a Pillow Pet under each arm. 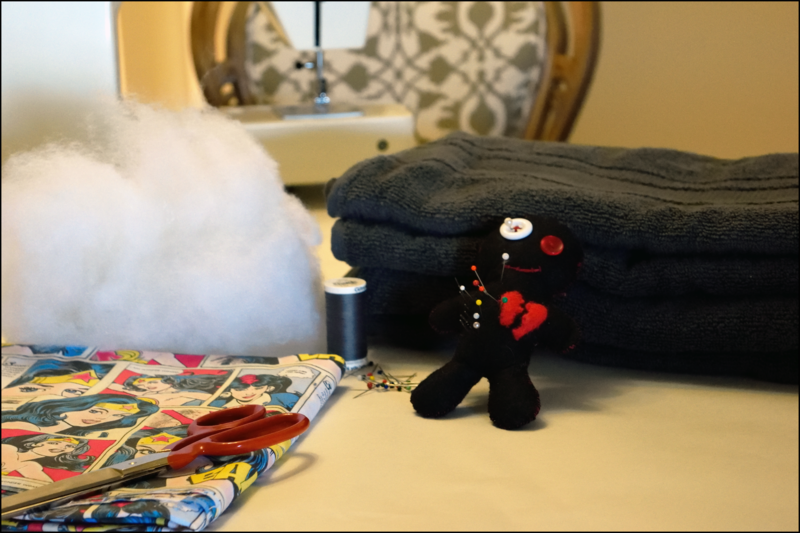 My best advice is to take it slow, pull it through straight, use LOTS of pins and remember that the toweling is quite thick, you’ll want a sturdy needle on the machine unless you want to break a few. I rolled up the beach bed and set it aside for the moment and got the Wonder Woman fabric out. 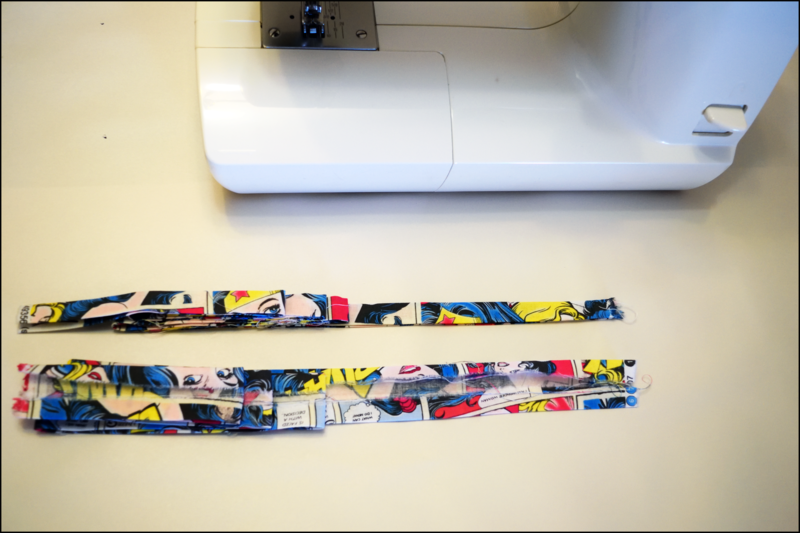 I cut 2 strips that were 6.5 cm wide…rather I made two small cuts in the fabric 6.5 cm apart and ripped the fabric down to the end. This makes a much straighter line than I could ever cut freehand and is quick and oddly satisfying. But if you want to cut it like a grown up with scissors and the like, go right ahead. I folded in the edges of the strips 1cm and pressed them. If you want ties that aren’t as wide as mine, turn the edges in further or make your strips smaller. 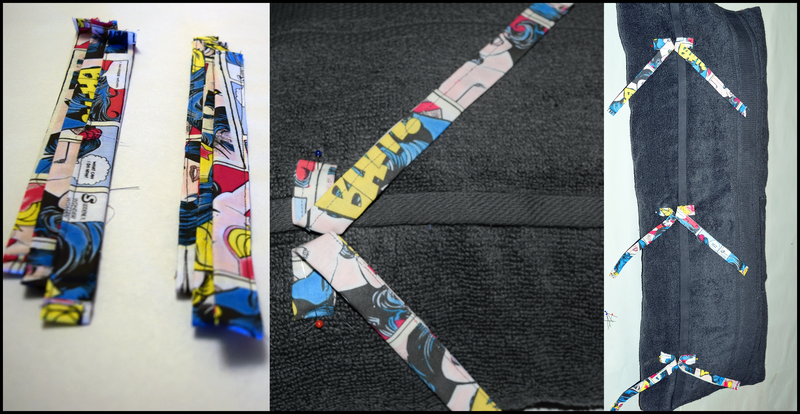 I wanted the strips wide enough that I would be able to reinforce the stitching as they will be holding the whole project shut while there is a fair amount of weight in the side pockets. After pressing the turned over sides, fold the strips in half longways and press them again. Run a seam down the open side close to the edge. Think your life is weird? Think again. Fantasy and Sci Fi Escapist. Convinced that Batman isn't a real superhero - he's a rich ninja with gadgets. .......is it time for second breakfast yet?